It was a pleasure working with Polish bride, Justyna, to create her beautiful wedding crown headpiece. We loved her vision – a simplified version of the Dita boho bridal headpiece but a little simpler and more compact so it sat more as a headband rather than a halo. One of the things we love about working online is we are able to work with brides from around the world. Justyna was our first bride from Pawlowice, Poland, and it’s such a lovely thought to think we share the same love for delicate details despite the distance and the time zones between us. We’ve always felt that a ‘one size fits all’ approach doesn’t always apply to wedding accessories. Quite simply, there’s about a billion wedding gowns out there, infinite hairstyle options, different face shapes, individual preferences and we all have our own unique style. Working with our brides is such a fun and creative process for us and it’s always exciting to see what beautiful pieces result from our collaborations. In designing Justyna’s customised Dita wedding crown headpiece, we looked to the Coco bridal hair pins for their simplicity. For a look that rustic and chic, we recreated the floral and pearl elements from the Dita and finished the piece with individually handcrafted flowers, lovingly made from clay in a soft ivory tone. Love this piece or want to chat about a custom headpiece for you? 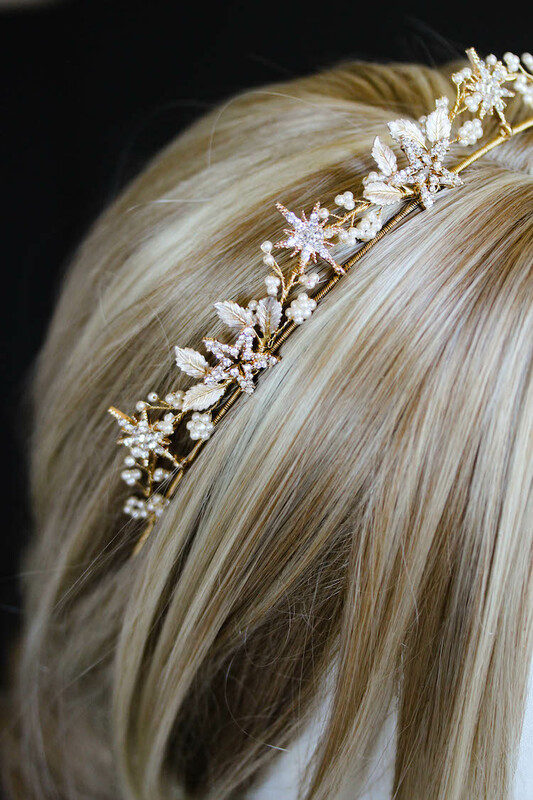 Justyna’s beautiful headpiece was handcrafted for her in golden tones but it can also be made in a beautiful silver tones which we think looks oh-so-lovely. We also think the elements of this headpiece would look gorgeous on a small hair comb. Just a little something tucked into a soft romantic updo could look quite gorgeous! If you’d like to chat about your bridal look or how other pieces from our collection can be customised to suit you, be sure to get in touch.